The technique of installing Subsurface Utility Networks in India is beginning to change. Installation by the traditional trenching method poses numerous problems. The most significant is the disruption caused to surface facilities and activities. In the past, trenching down the center of the street was the standard method of design and construction. The costs of repaving, traffic disruption, and impact on business adjacent to the construction and the environment were ignored. But times are changing. The 2000s bring an increased awareness of environmental issues. What was acceptable five to ten years ago is not acceptable today. In the right geological conditions, microtunneling is and will be the preferred technique of installing utilities at precise line and grade. 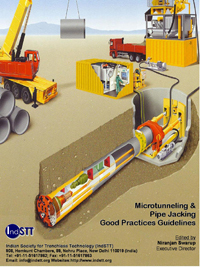 The use and benefits of microtunneling have been clearly established in Japan, Germany, United States, and England. India needs to adopt that same acceptance. To do so, manufacturers must have the microtunneling equipment readily available; contractors must be willing to use trenchless techniques and make a profit; owners must be willing to encourage the use of new technology; and engineers must produce complete and accurate design documents. Microtunneling is an effective means of installing utilities underground throughout first world countries. The process is slowly developing acceptance world over. For microtunneling to succeed, public agencies must begin to factor in the environmental and social costs of installing utilities. They must resist the urge to simply “do it the old-fashion way.” Microtunneling designs are beginning to develop. Design documents will begin to become stronger and less risky. To this end, engineers are needed to produce the design documents necessary to produce competitive bids, at the lowest overall cost, and with the lowest acceptable risk for the owner as well as the contractor. To accomplish these objectives, engineers must begin to fully understand the microtunneling process. They must be able to establish the proper layouts of plan, profile, and shaft locations. They must anticipate the potential problems and hazards by documenting the geotechnical conditions, and establishing a geotechnical baseline. Environmental considerations and permitting should be factored into the design and cost estimates. The design engineer also must make sure the project can be accomplished or, more importantly, recognize when conditions are not right for microtunneling. During construction, the design engineer should review the contractor’s submittals, making sure the client’s concerns are addressed and covered and to help safeguard against the job going bad when an inexperienced contractor is on board. And lastly, the design engineer should provide construction services and inspection to verify that the intent of the design is realized and assumptions made during design are confirmed. What is the current status of microtunneling operations in India? Poor, because they are in the early stages. Most contract drawings show only plan and profile without specifying the method of construction. The drawings simply show the alignment, the route the network line must follow to connect point “A” with point “B”. Since contractors have already invested in equipment and personnel for trenching jobs, most subsurface installation projects rely heavily on the use of trenching. Trenching is selected by most contractors because they have the equipment available and personnel trained to use it. Contractors are willing to undercut their costs in an attempt to keep their existing equipment and personnel working. They are unwilling to invest in new equipment or training of men to operate it. For some projects, special circumstances may exist that appear to favor microtunneling. These special situations can included crossing under busy roads or streets, wetlands or environmental sensitive sites, or sensitive buildings. Even here however, few designs specify trenchless techniques. In most cases, microtunneling is not considered an option because the cost is too high for the isolated applications. It is cheaper for that contractor to dig an oversized tunnel and then slipline the product pipe and backfill, unless he has already invested in a microtunneling machine. These guidelines are an attempt to provide a reference tool to all the stakeholders facing the requirements to develop or manage a Subsurface Utility Network where open trenching is not possible or is expensive.